U.S. nonfarm payrolls accelerated in August. The economy added 200,000 jobs last month, following a rise of 147,000 in July (after a downward revision). However, the solid headline number was accompanying by downward revisions in June and July. With those, employment gains in these two months combined were 50,000 less than previously reported. In consequence, after revisions, job gains have averaged 185,000 per month over the last three months, or 196,000 over twelve months, still significantly above the level needed for a gradual tightening of the labor market. The gains were generally in line with expectations. And they were widespread: both the professional and business services and education and health services added 53,000 jobs in August. Construction added 23,000 jobs, wholesale trade – 22,400, transportation and warehousing – 20,200, leisure and hospitality – 17,000. Retail trade, information, manufacturing and government cut jobs in August. Although the annual pace of job creations declined slightly in August, it has remained positive, and generally in an upward trend since the fall of 2017, as the chart below shows. 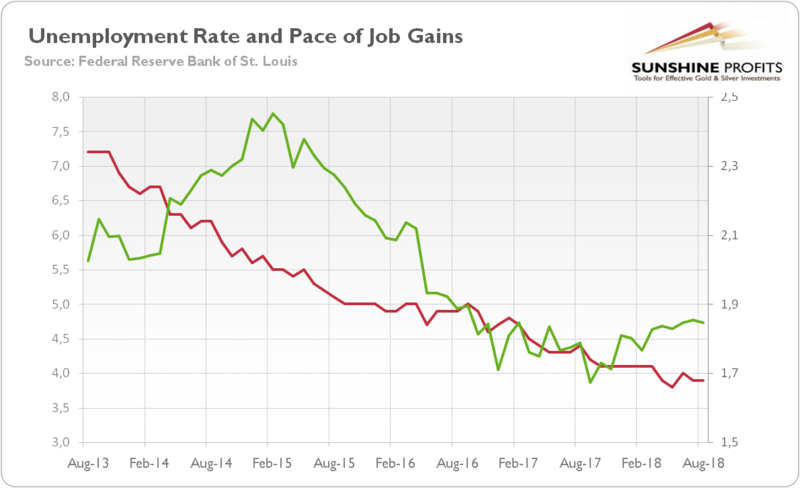 Chart 1: U.S. unemployment rate (red line, left axis, U-3, in %) and total nonfarm payrolls (green line, right axis, % change from year ago) from August 2013 to August 2018. The unemployment rate remained unchanged at 3.9 percent. However, both the labor force participation rate, at 62.7 percent, and the employment-population ratio, at 60.3 percent, declined by 0.2 percentage points in August. Importantly, the average hourly earnings for all employees on private nonfarm payrolls rose by 10 cents to $27.16. It implies that they increased 2.9 percent over the year. It was the fastest increase in worker pay since the end of the Great Recession, as the chart below shows. Chart 2: Average hourly earnings of all private employees (percent change from the year ago), from March 2007 to August 2018. The rise means that the U.S. solid economy is finally translating into wage gains. It is great news not only for workers (whose incomes have not kept pace with rising inflation), but also for the FOMC members who will meet this month. They can hike the federal funds rate in September with a clear conscience. What does it all mean for the precious metals market? 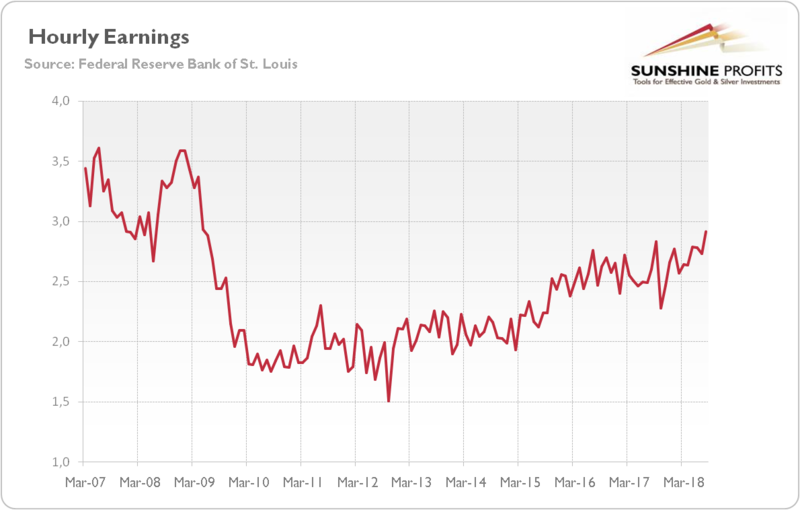 Well, the recent employment situation report is positive for the hawks among the U.S. central bankers, so it should upset gold bulls. Indeed, yesterday, Lael Brainard, the Fed Board Governor, said at the Detroit Economic Club that the Fed may be able to hike interest rates more times in 2019 than commonly thought. As a reminder, traders expect that the U.S. central bank will raise rates only one or two times next year. But Brainard argued that Trump’s fiscal policy lifted the neutral level of interest rates, allowing the Fed further upward moves. Of course, after the FOMC meeting the outlook will be clearer. However, the broader macroeconomic context is rather negative. Although the PPI missed expectations in August, inflation is around the Fed’s target. The labor market remains strong and even wage inflation accelerated. It suggests that the Fed will continue its policy of gradual tightening, exerting some downward pressure on gold prices. Hence, although the jump in wages should be positive for gold, which is a hedge against inflation, at least in the long run, it may also change the Fed’s stance toward a little more hawkish one. Wage growth has been recently the labor market’s Achilles heel. So the more decisive increases in earnings could make the current FOMC even more hawkish. Stay tuned!